Online Ticket Sales are now closed! You can purchase tickets at the door ($36 each) with a credit card or check - we can't accept cash. Many of us remember being dragged to Sunday School as young people. BUT WHAT IF your Sunday School experience was transformed by a magical, time-traveling, klezmer-playing, space-station-launching time capsule. 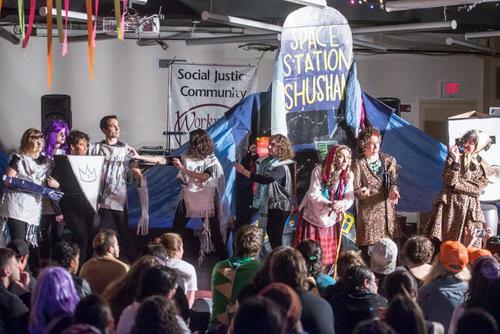 Join us as BWC's Shule students and our audience are taken on a wild journey through the stories of our roots, resistance, and resilience by our Yiddish Chorus, Radical Gragger Purim Spiel cast, and special guests. Come be a part of the magic-making! Join us before the performance begins for a pre-concert Festival! 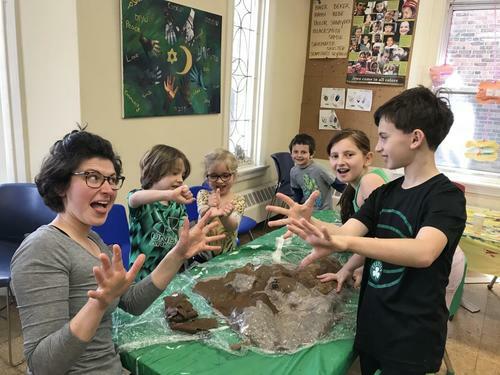 The festival will feature a radical DIY printing station, photo booth, Yiddish magnetic poetry, interactive life-size timeline and 3-D tree displaying BWC's secular social justice history over the past 30 years, lecture by Dove Kent about white supremacy and antisemitism, and presentation by Sherry Mayrent on the preservation of Yiddish culture through music. Yiddish culture was for much of its history primarily transmitted orally. During the late 19th and early 20th centuries, when the popular culture was flourishing, the parallel rise of the recording industry and the huge numbers of 78 rpm recordings that were produced offer access to the work of generations who never had a chance to transmit their knowledge in person. This presentation explores the Mayrent Collection of Yiddish and Hebrew 78s, one of the most comprehensive such collections in the world, and some of the ways its dissemination can assist and inspire scholars, performers and other collectors of popular and ethnic materials. It is said that there is no neutral position in relationship to white supremacy: either you are targeted or you're complicit. But what if you're both? As a multiracial Jewish community, how can we understand our multi-layered relationships to white supremacy? What are the different ways in which we are targeted? What are the ways in which some of us are complicit? How are these forces in relationship? This (brief) workshop will examine these questions and apply them to our work for justice and equity. Whether you are brand new to BWC or have played a role in creating this legacy, this will be an opportunity to be a part of the unique community that we continue to create together.